Lewis Carroll’s Alice’s Adventures in Wonderland is a classic story with classic illustrations to match. Check out some of those famous lines and illustrations captured in jewelry! Do your coworkers/children/family drive you crazy? 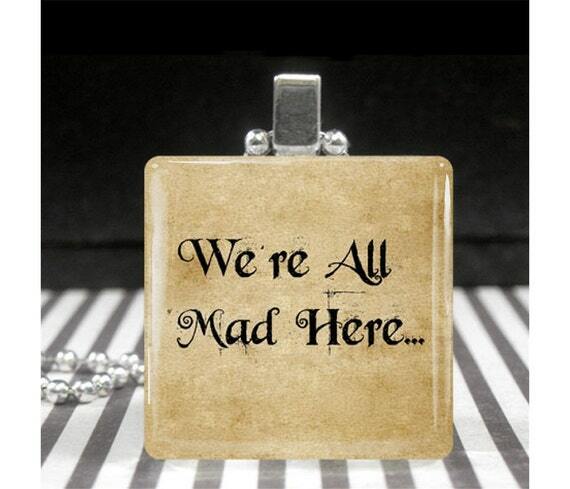 Express the madness with this “We’re all mad here” necklace. Personally, I’d hang this on my Christmas tree just to let any visitors know what they’re getting into. “I can’t go back to yesterday because I was a different person then.” So true, Alice, so true. Also available in silver, this necklace is both the namesake for today’s post and an adorable tribute to Alice’s tumble down the rabbit hole. “Charm” your friends with this adorable copper charm necklace!